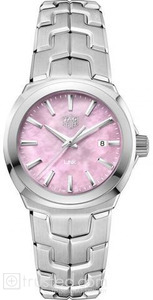 This TAG Heuer Link Quartz timepiece features a 32 mm steel case, steel bezel, pink mother of pearl dial with date window at 3 o'clock and a steel S-shape bracelet. Ever since 1860, TAG Heuer has successfully embraced a number of contrasting elements: heritage and innovation, prestige and performance, sport and glamour. 10:00 a.m. – 6:00 p.m.
10:00 a.m. – 9:00 p.m.
9:00 a.m. – 6:00 p.m.
11:00 a.m. – 6:00 p.m.
10:00 a.m. – 8:00 p.m.
9:00 a.m. – 9:00 p.m.
10:00 a.m. – 9:30 p.m.
10:00 a.m. – 10:00 p.m.
12:00 p.m. – 8:00 p.m.
10:00 a.m. – 5:30 p.m. Regulator (time-measuring device): quartz crystal. Electrical current that causes the crystal to vibrate very consistently and at a very high frequency (32,768 times per second). Have a quick question or comment?